I am not the kind of person that counters people's claims with my own claims as a way of minimizing other people's experiences as credible. So when y'all say, "2017 was a really sucky year" I'm over here like, "Dang. Word? I'm sorry to hear that, Cousins." In addition to my head scratching about why 2017 was so horrible for so many people, I feel a great deal of compassion and empathy because y'alls 2017 sounds like my 2011. For those of you that have been following me for any number of years, months, weeks, minutes... you know I talk often about how BOOTY WACK 2011 was. So I get it. If you say your 2017 sucked... I believe you. However, while I genuinely and sincerely hate that 2017 was trash for so many of you - my 2017 was LITerally a whole come up. Here I will share with you the highlights of my year and at the end I will tell you what I KNOW for sure about 2018! January 2017: I moved back to the Bay Area for a second semester in high residency in grad school. It was a super faith move because I didn't have any money and hadn't secured a place. I was going to be staying with a girlfriend of mine for a few weeks but I needed to come up on a place to live fast. In the meantime, I turned 34 on the 16th of the month. My birthday was incredible. And despite the fact that I was 27 seconds away from homelessness... all was good. EbonyJanice (me) in San Francisco on my 34th Birthday! Had JUST left the spa. February 2017: I emailed someone that I had randomly been put in contact with a few months earlier about housing and was informed that they did have a one bedroom available for a Bay Area steal. I say Bay Area steal because $1317 for a one bedroom is not a steal in most places on the planet... but my fully furnished 1 bedroom apartment DIRECTLY next door to my school (where I also worked) and 1 block away from my gym, UC Berkeley's campus, and a bunch of shops and restaurants... Steal! March 2017: I moved into my new apartment and only slept there for a few days before I traveled to Southern California (with a travel scholarship from the American Academy of Religion Western Region) to present my paper on "Beyonce's Lemonade as An Old School Testimony Service." This was HUGE for me. Not only was it an incredible honor - this opportunity also confirmed for me that my academic career isn't a fluke and I'm not a fraud (this is a thing that many black women in academia struggle through - I'm not making this up). From the AAR Wester Region paper presentation I flew out to DC to participate in another week long education experience and got to see my Aunt, Uncle, and cousins for a day before I headed back to class in Berkeley, California. April 2017: I started getting coaching from a new coach. Its the most I've ever paid for coaching but when I say my coach has forced me to LEVEL UP... the following months turn up is going to prove my point! May 2017: I launched my What Would Erykah Badu project. The reality is, I had this idea for 4 years just sitting in a file on my desktop. Chilling. I was scared to do anything with so many of my ideas but I knew I just needed to leap. So I did. I'll share another blog later this week about how I launched this project with less than $20 and 6 presale orders. June 2017: Erykah Badu liked 3 of my #WhatWouldErykahBadu posts. The bodysuit was still in presale status at that point. Then she commented on two more posts a few minutes later. That night I went to sleep excited that Erkyah had seen my post and was excited about them. When I woke up at 3am to go to the restroom I had received 78 orders, 250+ new followers on Instagram, and 100's of likes and tags in a post (that I thought was my post because it was my picture) but it turns out it was Erykah Badu that had reposted my photo and my friends (SQUAAAD) were tagging me under all the comments of people asking where they could get my bodysuit. July 2017: It was time to deliver on my product. I had over 150 orders (preorder status) so I decided to expand the project from just the red bodysuit to a maroon, white, and blue bodysuit. There were MANY technical difficulties (which I'll talk more about in a later blog post as well) but I was so committed to integrity and exceptional customer service that I was able to pull off getting all of my orders out, with several reorders when the new colors dropped. 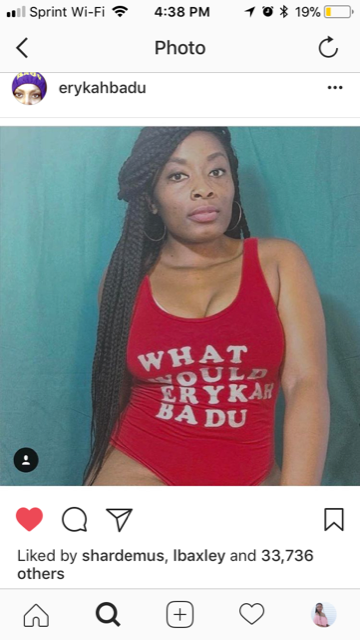 August 2017: I released a tshirt and tank dress version of the What Would Erykah Badu project and the sales continued to come in. I mean, we did great numbers with the #BeyonceKnows project but Erkyah posting the bodysuit affirmed this project on a whole new level. Another really dope thing that I did was ghost wrote a book for a dear friend. I love helping people write books. I think it is part of my ministry to make book writing and book publishing less scary and tedious. You have a story - you have a book! But I especially loved helping this particular person write a book because he NEVER imagined himself being an author. Now look at him. His ideas, thoughts, and encouragements are a whole book. That's pretty dope. August was kind of book heavy for me because I also collaborated with this incredible ministry to publish a curriculum for their nonprofit. As I type this, in this very moment, I can agree with you - I be doing TOO much. But the workbook is incredible and I'd be very honored if you'd take a moment to learn more about FAILSAFE-ERA. I returned to the Bay Area (I was in the SouthEast for the summer), moved back into my apartment (the rent went up to $1385) and began to prepare for a full courseload PLUS my first teaching job, as I was going to be teaching "Black Girl Magic: An Introduction to the African Spirit Religions, Southern Black Christianity, and Black Spirit Themes in Beyonce's Lemonade" course that I created for a teaching fellowship opportunity I got through my school. September 2017: My class was going AMAZING. You can search the #BeyonceSpiritJustice hashtag on Twitter to follow the class discussion from week to week between myself and my students. Additionally, I released a long sleeve What Would Erykah Badu tshirt and y'all loved that jawn too! Growing my business while being in school full time and teaching became much easier as I increased my meditation practice. Nameste and ish. October 2017: I realized that I wanted to release more merch so I dropped the Marcus Garvey Was Right sweatshirt and the Protect Black Women sweatshirt. A percentage of all proceeds of all sales goes towards the tuition of high school aged girls in Nyahururu, Kenya. We did so much in 2017, at this point, that the school administrator reached out to me and asked if I would consider allowing them to allocate some of those funds to building a fence to secure the entire school's property. (Of note: THIS might be the thing that makes me most proud because I know first hand how unsafe that property can be). One thing I'm MOST proud of is that I launched my dream project, Black Girl Mixtape. It was a dream. I wrote the vision. I gathered a small team of brilliant black women. We came up with a plan. Black Girl Mixtape Bay Area was a HUGE success. You can learn more about Black Girl Mixtape HERE. November 2017: I learned that my paper proposal for American Academy of Religion Western Region was accepted for the second year in a row and that I would be presenting in the Spring of 2018 on the topic of Hip Hop Womanism from the perspective of Black Girl Rituals. Son! My dream of talking about hip hop in a serious way and eventually getting paid for it is getting closer and closer. Also, November 2017 I went to AfroTech! INCREDIBLE. You'll hear MUCH more about this experience in blog posts, podcasts, youtube videos, and with the launch of an INCREDIBLE new business venture in 2018. But in the meantime... shoutout to the really dope black techies that I met in San Francisco. I will never be the same. Additionally, in November of 2017 I was the keynote speaker at a conference for Boys and Girl Club of San Francisco. I got to talk about hip hop, social justice work, and the bible and they paid me to come cut up like that. THIS IS THE LIFE! Afterwards I met some incredible people and randomly got to facetime with Kimmie G - one of Beyonce's lead dancers. I'm a stan. Deal. And in November of 2017 I hosted a really dope music ethnography workshop on Hip Hop Womanism. This workshop is coming to your heart and your city soon. So stay alert! December 2017: I finished my coursework for my Masters of Art in Social Change degree, received incredible affirmation from my grad school advisor, Dr. Gabriella Lettini, regarding the work that I am doing and the work that I want to do. I launched my Tweet Sway campaign - which is where I tweet @realSway every single day a #PreachEb in an attempt to gain the attention of people documenting hip hop in a serious way so that we can discuss Hip Hop womanism in a serious way. Sway and I haven't talked yet but I KNOW 2018 is the year that #PreachEb becomes everything she was created to be. 2017 was all about getting this consistent, credible content prepped for such a time as this. My dad flew to the Bay and drove back with me to the east. 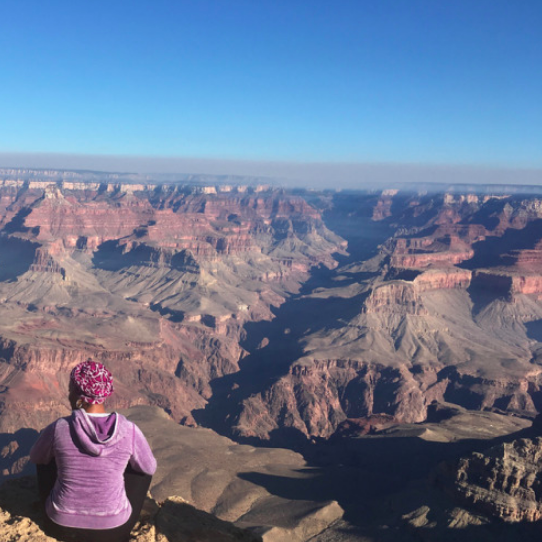 We stopped at the Grand Canyon. SON! There are no words. This was on my bucket list. To drive across country and see the Grand Canyon. I am so proud of myself for making this happen. The Grand Canyon is too much. My heart almost exploded when I first saw her. Just wow! After the Grand Canyon we stopped in Dallas and spent a day with my Uncle. I love him so much. I'm so glad we got to see him. The stories him and my dad told me about my grandmother also gave my heart so much joy. When we left Dallas, we stopped for about an hour in Meridian, Mississippi (which is where my dad is from - also this is where Big KRIT is from LOL). No one knew we were coming we were just hoping that we'd see my Uncle. As we were pulling up to park my uncle was pulling up to park. PERFECT TIMING. It was incredible seeing him. Talking to him about my grandfather and my grandmother also made my heart smile. Also in December of 2017 I launched an entirely new brand: Belle Noire Everything. Well actually - it existed and has existed in various iterations for years but its back and I'm excited about creating some fun projects with that brand in 2018 as well. This is a highlight because I had some insecurity about launching a brand totally separate from the work I do with The Free People Project but then I thought about it and did the work to come to the conclusion that I Am A Mogul! Period. And I'm excited about creating from that place instead of the low vibrational spaces of, "Is this okay?" "Are people going to accept this?" Nah... I'm a Mogul! This is dope. Selah! So yeah... I'm missing some stuff. Everything wasn't perfection but I came, I saw, I conquered. More than anything I'm looking to ESTABLISH a thing in 2018. Between the work I do with The Free People Project (A Little Self Help Company, Hip Hop Womanist, Black Girl Mixtape) and my mission to become a mogul... I also intend to do the work to manifest my best love in 2018. <- That work is a whole other blog post for a whole other day. But now you have so much to look forward to. In this one blog post I have promised you 3 other blog posts. I'm committed to sharing the most high-quality content with you in 2018 onward. I want you to know how I maneuvered the awkward solar energy shifts of 2017 and still came out victorious, despite and inspite of myself and the calamities that certainly tried to take me under. The relaunch of my youtube channel and the launch of my podcast: "RAP THEOLOGY" along with the release of my book with Nikki Blak, "Halos on Afros: Radical Black Feminist and Womanist Thoughts on the Divine" and my new book, "Aint I A Hip Hop Womanist Too" - plus Black Girl Mixtape is going on tour... likely to a city near you! Ayyyyyye! 2018. The Year To Establish. See you in the glory.